The sharp suit is a nod to power. Being grilled by Congress is a different sandpit clearly — the rules of play change, and over the last week, Facebook chief Mark Zuckerberg has acknowledged that in his dressing, demeanour and indeed, drama. Congressional hearings on Tuesday and Wednesday this week had Zuckerberg show up in a navy suit with what is being described as a Facebook-blue tie, and a navy suit again, complemented by a tie in an unobtrusive dark blue on the second day before the Chamber. The change of attire indicates that he has grown up, or that he is ready to take responsibility, together with the grown-ups who are grilling him. For someone whose trademark attire has been jeans and T-shirt that project simplicity — a down-to-earthness, if you will — this new look already states that he is willing to try to gain the approval of the authorities, and play by their rules. His written statement further reads: “It was my mistake, and I’m sorry. 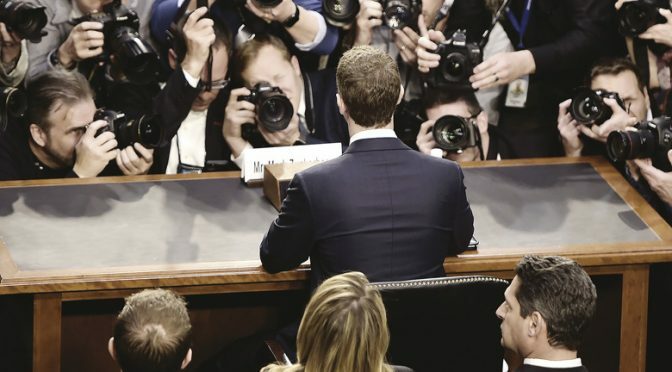 I started Facebook, I run it, and I’m responsible for what happens here.” Point to note is, he repeated this, word-for-word on Tuesday in his hearing. Owning up, contrition, not assigning the blame elsewhere, not looking for a fall guy, an appearance that shows a willingness to change, to improve, to do better. Apple chief Steve Jobs’s attire of Issey Miyake-designed black turtleneck and Levi’s jeans may or may not have been an inspiration for Zuckerberg. His grey t-shirt and hoodie with jeans atop flip-flops may have led many to wonder if that was how he would turn up to answer a barrage of questions from the lawmakers of the largest democracy in the world. Larry Kudlow, Trump’s economic advisor was widely reported as saying, “Is he going to behave like an adult? As a major corporate leader? Or give me this phony baloney, what is it, hoodies and dungarees? What is that?” Zuckerberg did scrub up pretty well to meet Obama, if you remember. Streetwear rules today, even in high fashion, but it’s the message behind his shall we say, relaxed look — this one says he is accessible, ‘normal,’ and his branding helps with product reach. Scarcely anything of this can be left to chance. Job interviewees have long been told to get their entrance just right, because you need a great first impression in five seconds. Princeton psychologists recently did a study that says there’s no such luck: you’ve made your impression in a tenth of a second. Millions of dollars are spent in getting the look-and-feel of a product just right. Millions of dollars are spent in branding exercises. No company or media-facing person today can afford to not be coached. Have your facts on hand, but don’t sound too scripted. The public relations machinery would have gone into overdrive long before Zuckerberg flew east to answer for the company he created in his college dorm, as he says. It’s shades of Julia Roberts, with, “I’m also just a girl, standing in front of a boy, asking him to love me.” It can’t be that artless, surely. If I was his PR person, I’d have said, own up. Mea culpa. Check. Don’t hide. Be available, open for business. Check. I’m not saying any of that happened. Can’t say that he was coached, endlessly, with 50 shades of the same question. Again and again, till he would be able to answer any query about Facebook in his sleep. In a hyper-connected world, where the microphones and cameras are always on, always watchful, it would be extremely important to have my client answer firmly, factually, completely, and most important, without hesitation. The slightest pause suggests prevarication or dissembling. So, subject knowledge (go over the figures), great eye contact — look at everybody — include the room. A PR exercise always suggests that you say at some point, ‘That’s a great question.’ And then proceed to answer it. I’d say it gets easier to answer questions when you’ve done the exercise on repeat. There is nothing quite like the confidence of an examinee when he has studied his entire course material. The initial butterflies will settle with the very first question. You’re off the starting block. Then it’s just a question of shifting into gear. I am calm. I understand where you are coming from. I am with you. Look at me — I am you. Harveena has no personal choice when algorithms and math manipulate her thoughts.